Have you heard of the blog, This Rawsome Vegan Life from Emily von Euw? It’s pretty sweet. Lots of yummy raw desserts and recipes! 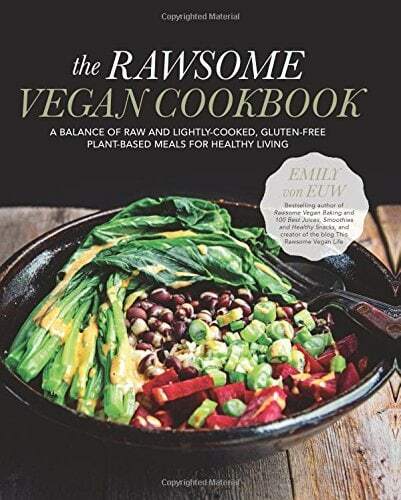 Today I am reviewing her latest book, The Rawsome Vegan Cookbook – A balance of raw and lightly-cooked, gluten free, plant based meals for healthy living. I also have her other 2 cookbooks, Rawsome Vegan Baking and 100 Best Juices, Smoothies and Snacks, so I was really excited to get my hands on this one as well. If you are into super simple recipes that showcase whole foods, this book is for you. Most of the recipes are very simple and they call for just a few ingredients. The book is divided into two parts: raw and cooked. Each recipe has a beautiful full color photo. My mouth was watering when I looked through it. Some of the other recipes I am excited to try are the Rawsome Pizza, Sweet Corn Chowder, and the Creamy Butternut Squash. This would be the perfect book to get someone that is starting on a healthy, vegan diet. To find out more about the book, click here. Today I am sharing a recipe from the book. The Healthy Rainbow Plate. 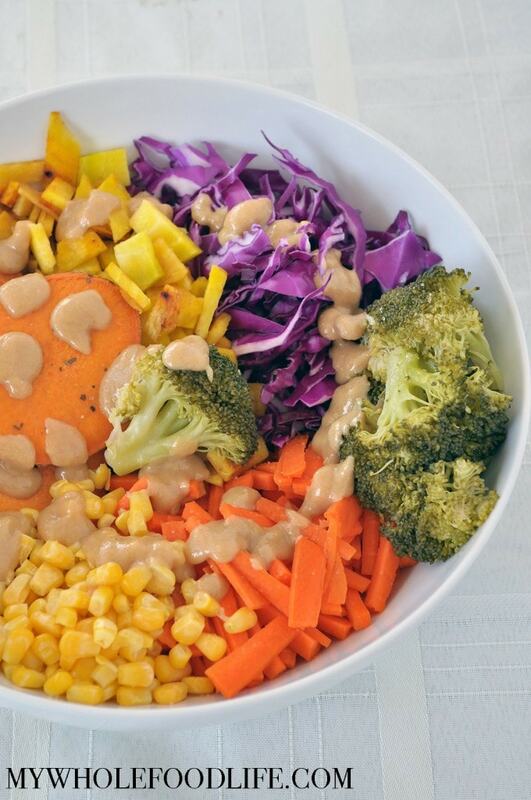 Rainbow bowl full of yum! Preheat oven to 350. Wash and scrub the yams, and then cut them into 1/2 inch slices. Toss with the basil and apple cider vinegar and bake for 40-45 minutes, or until they are tender all the way through. Cut the broccoli into florets and steam for 10 minutes, or until tender. Shred the beets, carrots and cabbage. In a small bowl, mix the tahini and maple syrup. Toss the veggies in the tahini and then salt taste. This should last at least 4 days in the fridge. Enjoy! Disclaimer: I was given a free copy of the book in exchange for an honest review. The end.